The sun is shining, the beach waves are calling, and our skin’s craving baby oil to achieve that delicious darker hue; but what about our hair? 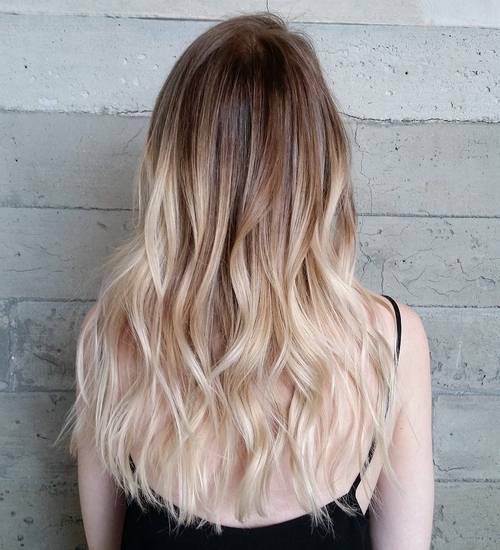 NOTHING says fun-in-the-sun like blonde locks! 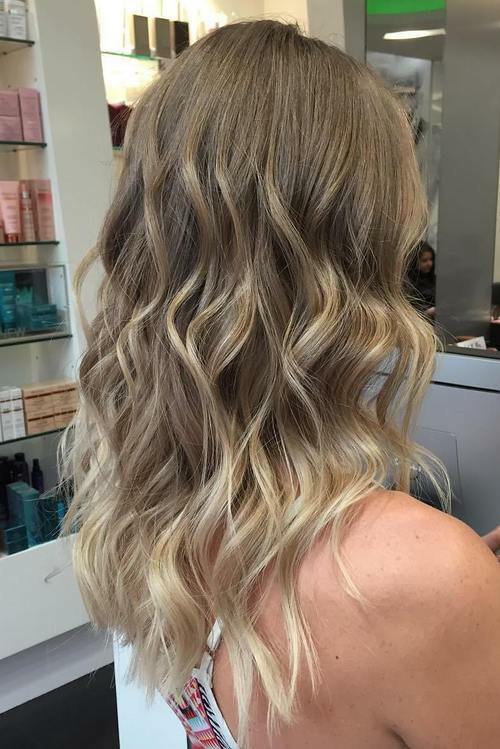 These stunning blonde bayalage hair designs are downright gorgeous and will really up your summer lifestyle. When struggling with thin hair that’s on the lengthy side, leaving your mane one noted with no texture is an absolute no-no. 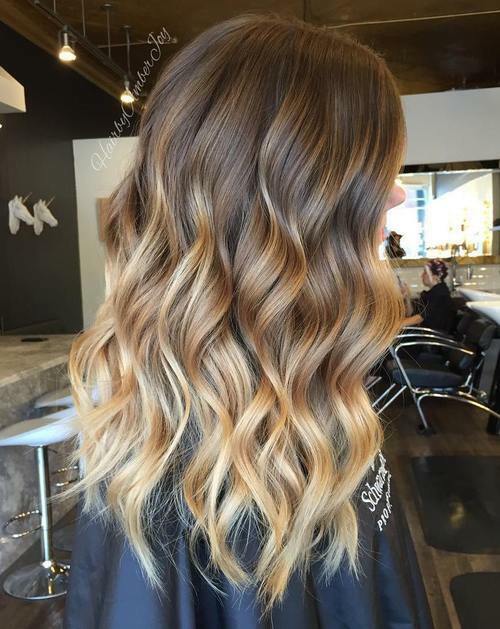 Bring those lovely thin tresses to life by going for a dirty blonde balayage that’s both texturizing and trendy, and throw in some loose ringlets to add bulk. 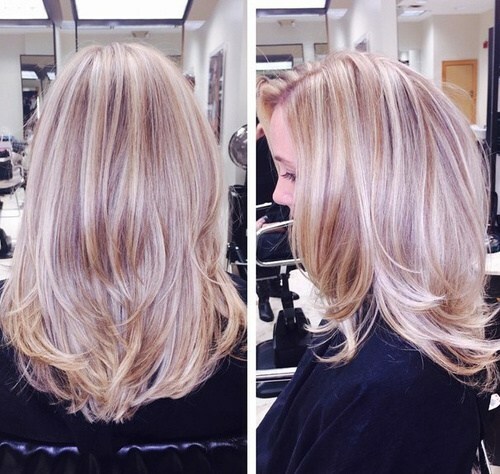 Layers are a great way to soften up lengthy hair and give it a bit of flattering contrast. 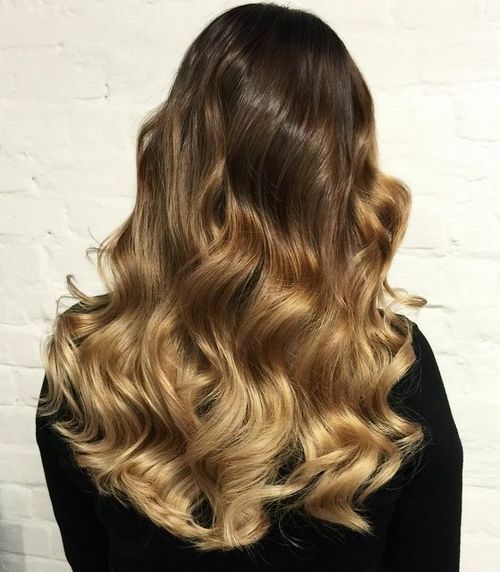 Making those layers the star of the show is a cinch when you decide on a gorgeous, all-natural balayage hair color like the one shown here: it’s darker hues of blonde on top, leading down to a lighter shade that’s fresh and neat. The color combination seen here is sultry and fabulous! Chocolatey roots are brightened by a caramel center and dazzling golden hues below, a delicious finish that’s beautiful whether left straight or curled. But we must say we’re in love with these retro, Hollywood waves, the ideal style that leaves you Runway-ready. Hints of highlights are found webbed into her dark brown roots, but those striking bright blonde tips are really what take the show. 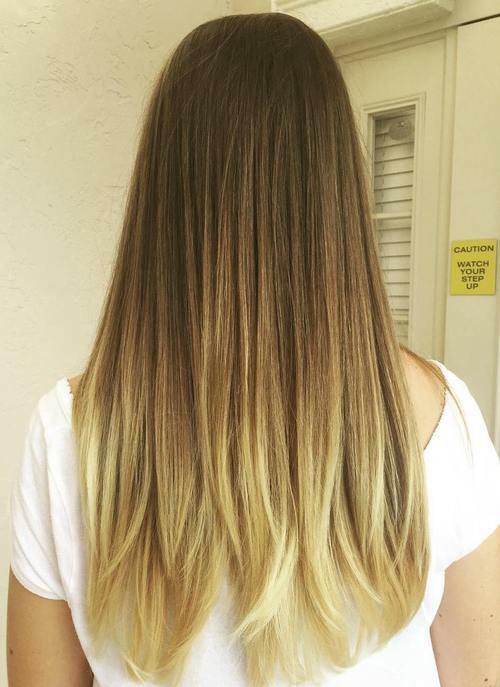 This fabulous combination creates a soft, gentle balayage that works well with her skintone. Purple lips and flipped ends tossed away from the face really makes her features pronounced. Why settle for just one color of hair when you can rev up your style with three? 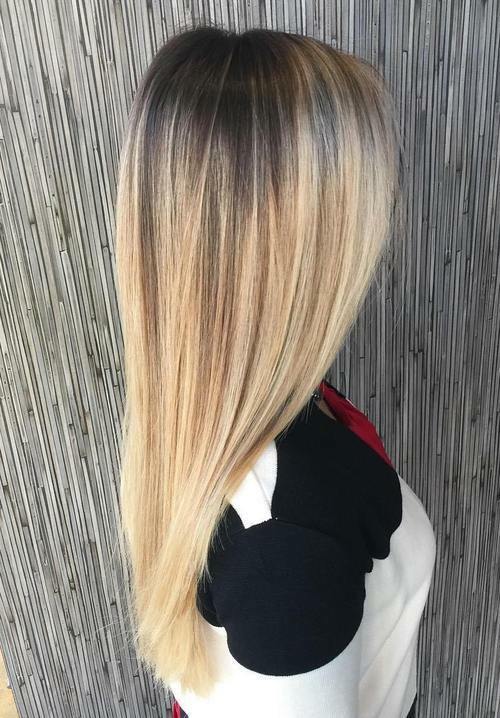 This awesome long hair is given a dose of gorgeous, three-tiered color, with mysteriously black roots on top, followed by a sultry shade of light brown, and platinum ends that are downright striking. Her extra loose curls on the ends are both sophisticated and elegant, perfect for black-tie affairs. 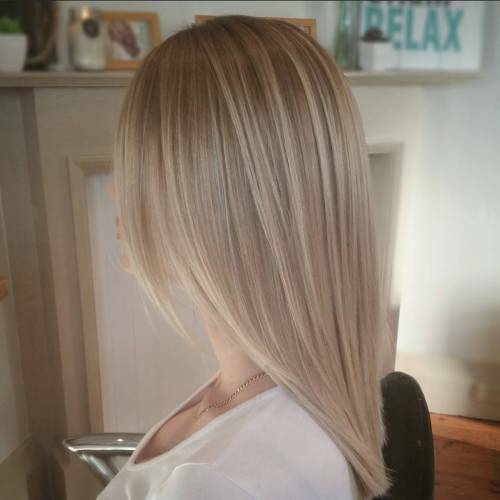 A dazzling, look-at-me platinum blond base is given a natural makeover with hues of light blonde throughout, a contrasting blend that’s sure to glisten in the sunshine. Add some gloss product to really make those tresses ablaze, and run a straightener through your mane for that slick straight, undeniably chic look. Brilliantly luminous, this fabulous hairstyle is given a wide variety of light and dark highlights for a very contrasting finish. Teased at the crown and textured with extra voluminous waves on the ends, this bulky look is fashionable as well as feminine- the perfect combo! This is an awesome option for older women or women with longer faces! A middle part is cool and casual and that darker hued blonde balayage plays beautifully against her lighter skin tone. A shoulder length cut is given refreshing, energetic volume with some simple loose curls. Blessed with alluringly dark brown locks? 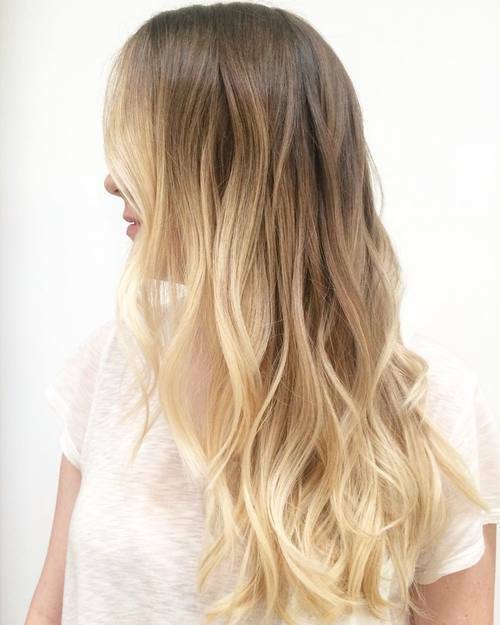 Showcase this stunning feature but give them a bit of an edge by dousing the lower half of your locks with some golden blonde tips. 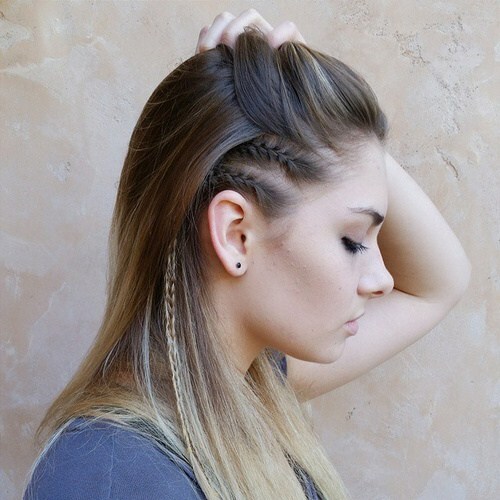 Add some miniature side braids to design a trendy, dainty finish that can be worn anywhere. If you want to keep your hair a darker shade, consider starting with a brown mane and adding some subtle, darker hues of blonde throughout. You’ll still get that beautifully bright blonde look without going overboard and drowning out your striking brown locks. Don’t forget sultry ringlets! 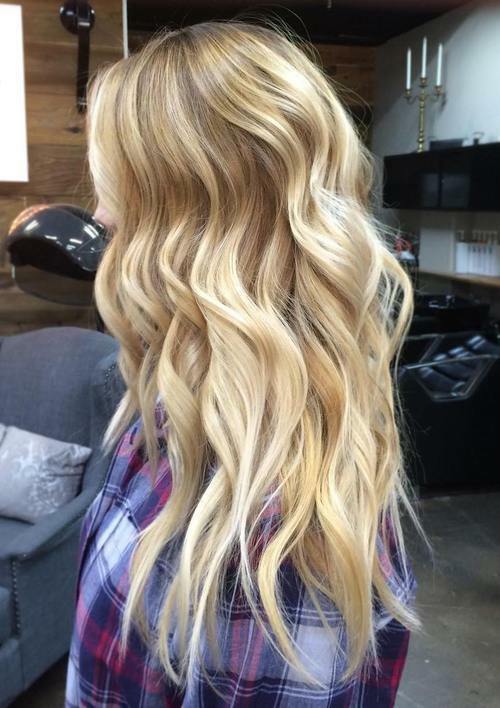 This hairstyle really showcases those stunning bright blonde ends, rolling them into fabulous textured curls. Instead of sticking with harsh ringlets, tousle them up a bit and throw in some product to get that relaxed, all-natural look that’s great for all occasions. Hair color ideas for 2017: Golden blonde and light blonde= a perfect combination! 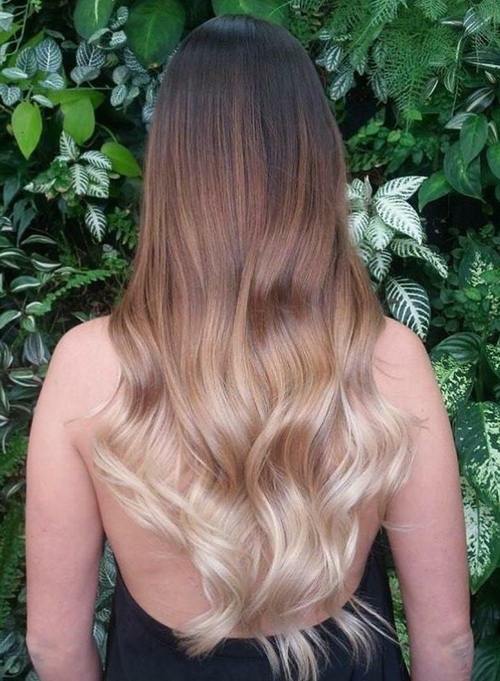 This hairstyle features a fab combo of golds and platinums for a sunkissed finish that’s truly delightful. Adding some loose, voluminous ringlets creates a gorgeously elegant appearance with plenty of volume. Simple, yet totally cute, this is an easy everyday style that’s great for thin hair. 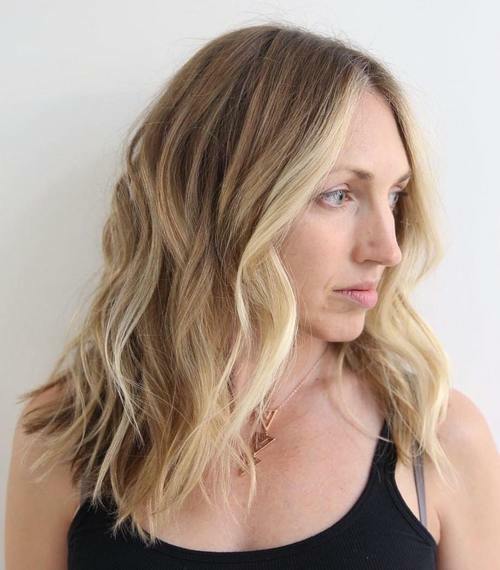 Ladies struggling with fine textured locks can get an instant boost of dimension by simply indulging in a light blonde balayage hair coloring,placed upon a simple short haircut with ends curled out for feminine appeal. Dark brown roots lead down to golden blonde tresses, a sunkissed tone that is downright beautiful. There’s a dazzling amount of lowlights and highlights for shiny contrast, and the loose beach waves are screaming summertime. Love this flowy, feminine style. Hairstyles for 2017: The contrast here is simply delightful! 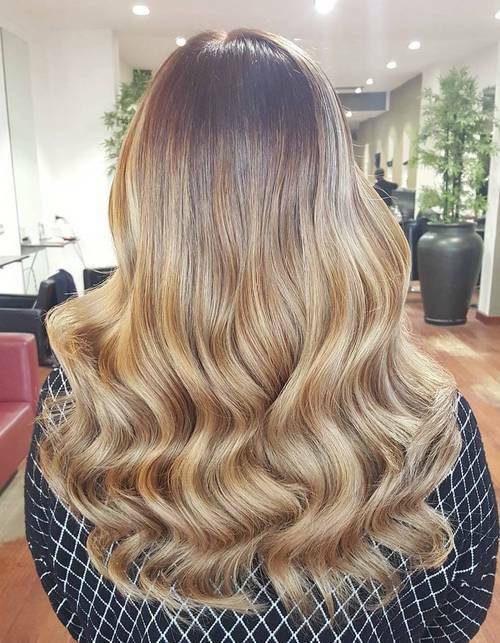 A chocolate brown upper half blends perfectly with a golden blonde lower half, a balayage coloring that’s verging close to ombre. And there’s no better way to amplify silky blonde locks than with some elegant cascading ringlets, a regal style that can be worn to the office as well as the pool party. 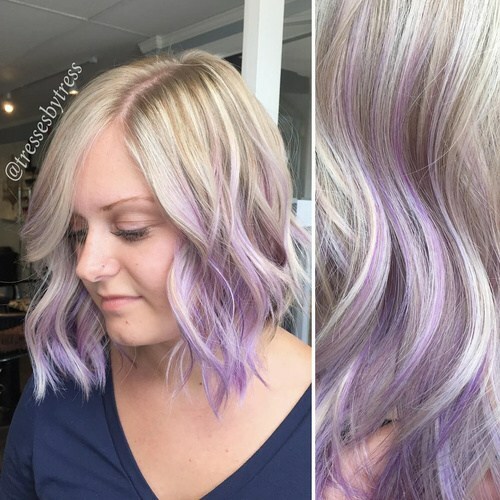 Lavender is one of the top hair color trends for 2017, and blended with platinum strands it’s a striking combination that glistens beautifully in the sunlight. Bring these delightful hues to life with subtle, loose curls that add sensuous body and flirty volume. 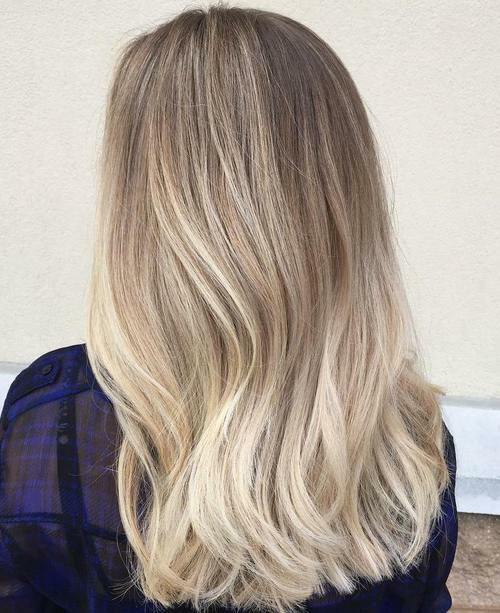 After spending hours in the sunshine, you’re bound to be left with blonde tresses that have hints of brighter hues throughout; and that’s exactly what this balayage color treatment has in mind! 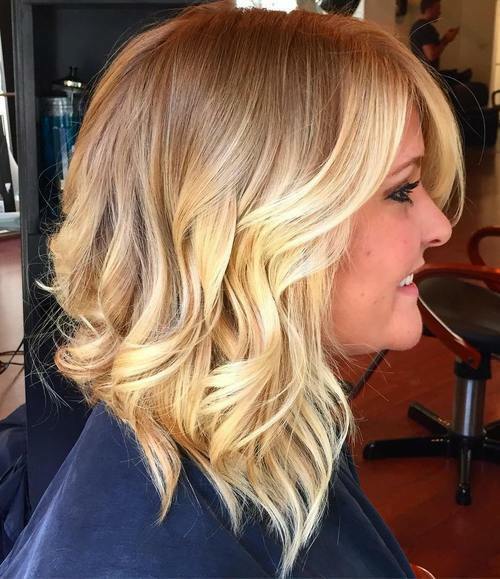 This all-natural blonde on blonde hairstyle is lovely and the cascading curls are simply divine. A feminine look that looks great on anyone! 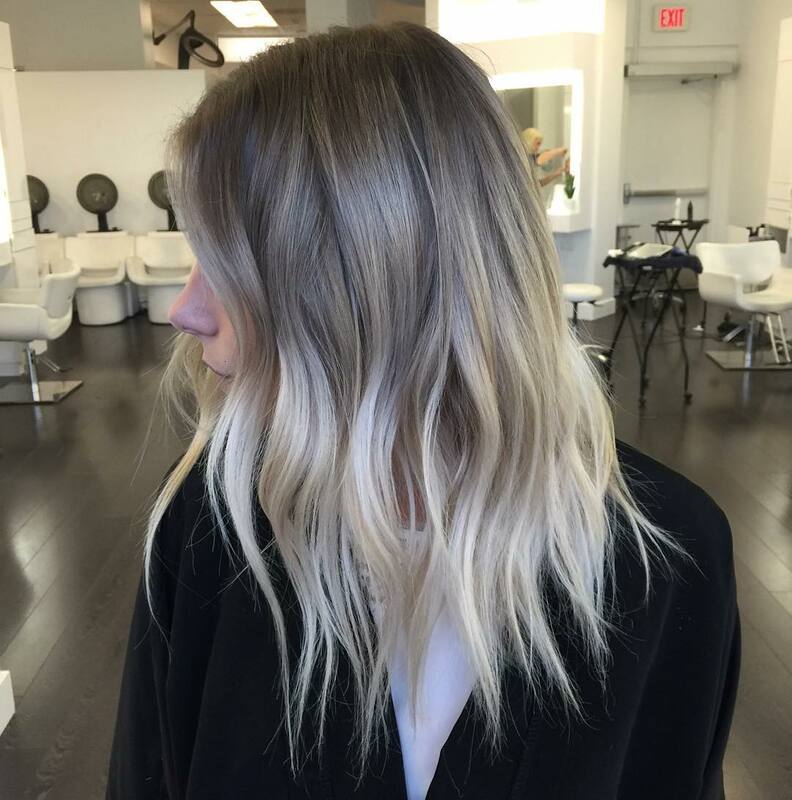 A darker upper half is brought to a beautiful, bright ending with hints of platinum and light blondes throughout. This bright, sunshiney style is textured with some delicate soft waves for a ladylike finish that can be dressed up or down with ease. Her lengthy locks take on an ombre appeal, with darker shades of blonde towards the tops of her locks with lighter hues on the ends. She adds an even deeper amount of dimension thanks to an alluring haircut with an angle that goes from short to long in the back. Tousle it up with some loose waves and slab on some pink lipstick for a flirty, free style. If you’re in love with your dirty blonde locks and desire that subtle, sunkissed finish, consider throwing in a few natural light blonde highlights through your mane for a mane that flows gracefully and effortless. Add in some loose, flowing waves for a burst of feminine volume that blows freely in the wind. Flowing hair that drapes down below the shoulders can be plain and boring if left all one color. Give your long, luxurious mane some beautiful, vibrant contrast with this stunning balayage blend of super dark roots and golden, sunkissed ends. A-lines are undoubtedly one of the hippest hairstyles in the fashion industry, a delightful haircut that casually angles with a lengthy front that caresses below the chin gracefully and cuts shorter in the back for easy styling. 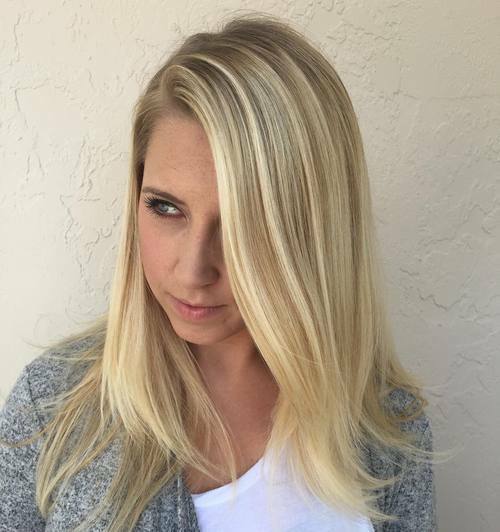 Her all-natural balayage blonde is a trendy combo with her flawless a-line for one feminine finish. 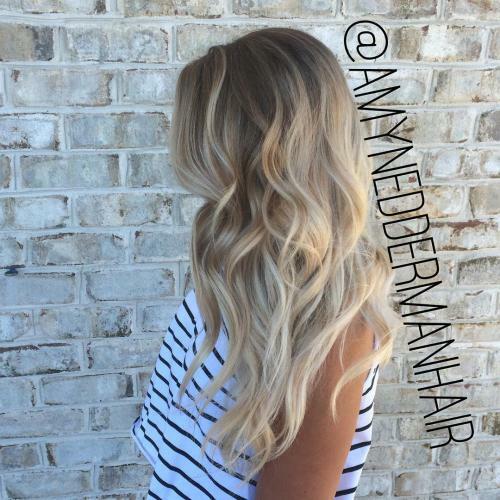 And the ash blonde balayage hair color is one of the latest most popular color! If you want to follow the trends, dye your hair in ash blonde now!